During two recent speeches in the last five weeks, President Trump has taken drinks of water using two hands. Why? 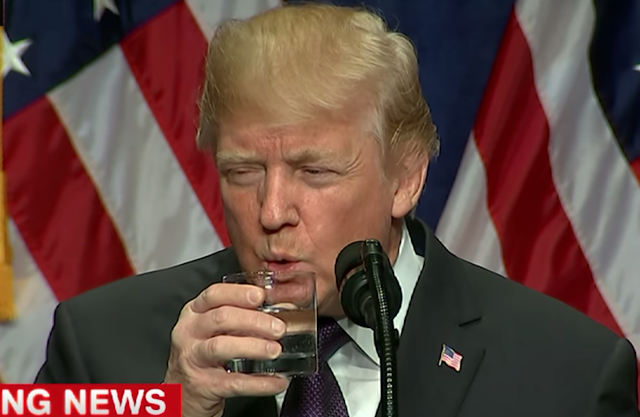 In a speech given earlier today, addressing issues of national security (included in the video above), the President displayed his two-handed drinking behavior during 6:50. 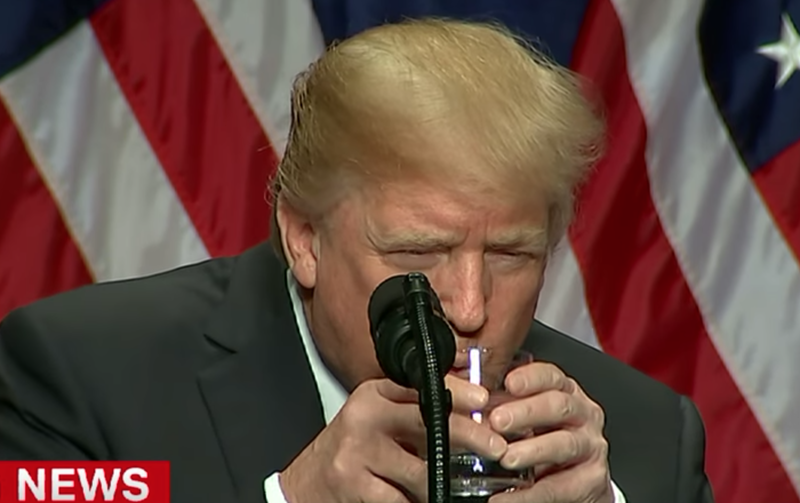 Notice how the President positions his fingers from each hand beneath the glass to stabilize its weight. This suggests he may have diminished grip strength. 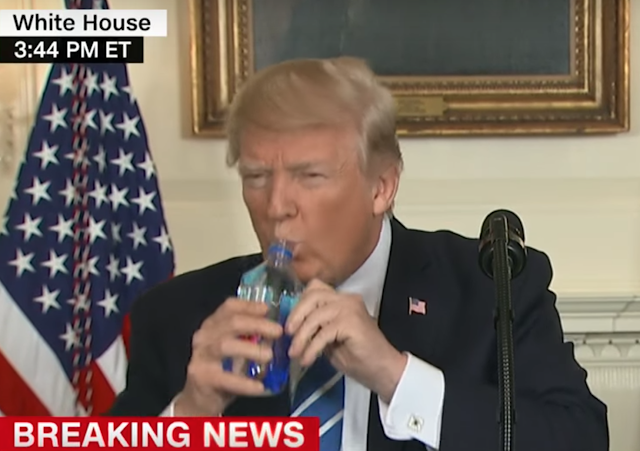 President Trump also draws both his upper arms and forearms closer to his torso than would otherwise be required for normal drinking behavior. He also dramatically foreshortens his neck as he also flexes it. His lips also purse forward to meet the glass. During 9:35 the President took a drink in a more conventional, one-handed style. Yet he still leaned forward, pulled his upper limbs inward, flexed his neck forward, and pursed his lips forward. He also stabilized the glass with a finger beneath it. 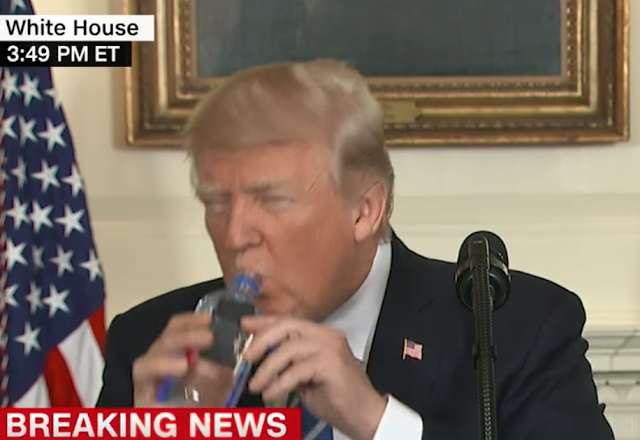 At 17:01, much as with the initial example, Donald Trump once again drinks in a two-handed fashion. This time he braces the bottom of the glass more firmly with his left hand. Donald Trump first publicly demonstrated this behavior in this speech (immediately above) on 15 November 2017, after his return from his trip to Asia. This example, similar to those above is seen at 11:41 in the second video. Once again during 17:06 in the later video. 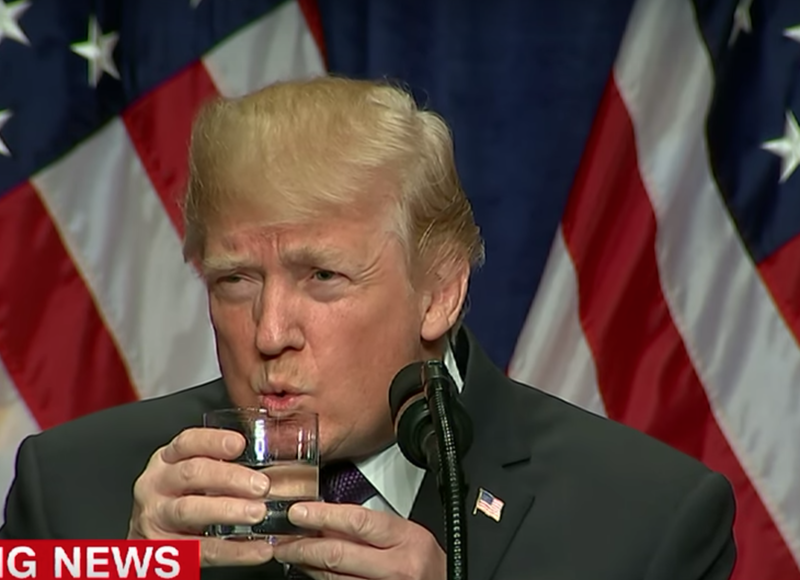 Summary: Many have inquired as to the body language significance of President Trump's two-handed drinking dynamic. As I am both a nonverbal expert as well as a physician, I can unequivocally say this behavior is NOT a body language phenomenon - rather, its etiology is medical. It's possible the President has a loose denture/veneer (as demonstrated in the last minute of his speech on 6 December 2017 regarding Jerusalem) - or anxiety about this or similar dental problems, but it's highly unlikely that it contributed to this bilateral hand behavior. In a general, possible causes of President Trump's two-handed drinking practice include disorders of the Central Nervous System (e.g., CVA, problems with proprioception, Trigeminal nerve lesion [CNS or PNS], etc. ), the Peripheral Nervous System (e.g., peripheral neuropathy, etc. ), or a pharmacologic (drug) side-effect (e.g., such as a psychomotor tremor secondary to stimulants, etc.). Any competent physician would recommend an immediate detailed neurologic evaluation.